The British Grand Prix remains one of the highlights of the International Motorsport calendar and represents the sport's spiritual home. It is where an astonishing seven out of the current, ten F1 teams are based and has been a mainstay of Formula One since the inaugural event in 1950. This always ensures tight and close racing. Winning the Silverstone round of the Formula One championship means everything. 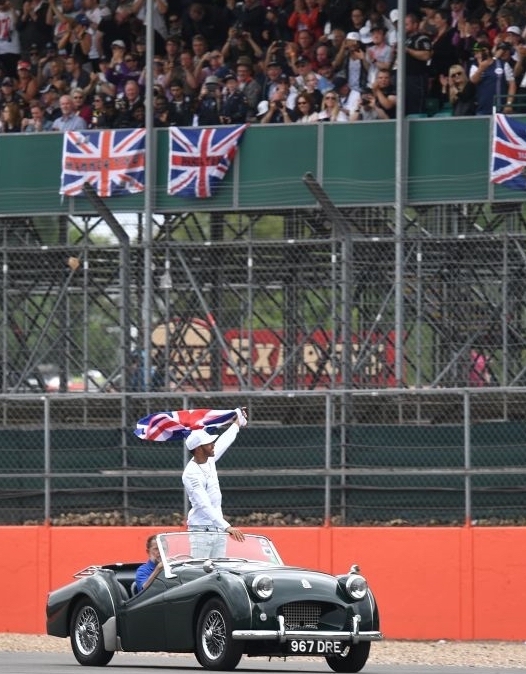 This year, the pressure was once again upon Lewis Hamilton to pull out a British win to satisfy the hundreds of thousands of fans looking on in anticipation and the further millions of fans watching from TV at home via Sky, Eurosport, BT Sport or Channel 4. 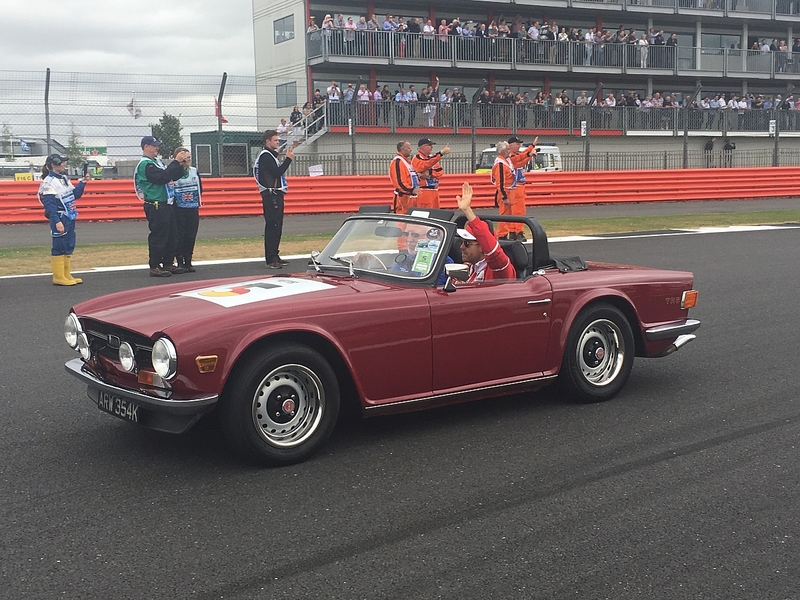 Those fans were also treated to another extra special feature of this year's British Grand Prix, a drivers parade featuring exclusively Triumph TRs provided by the TR Register Car Club to chauffeur the worlds top drivers around one full lap of the circuit in order for them to be seen up close and personal by the fans in the terraces. 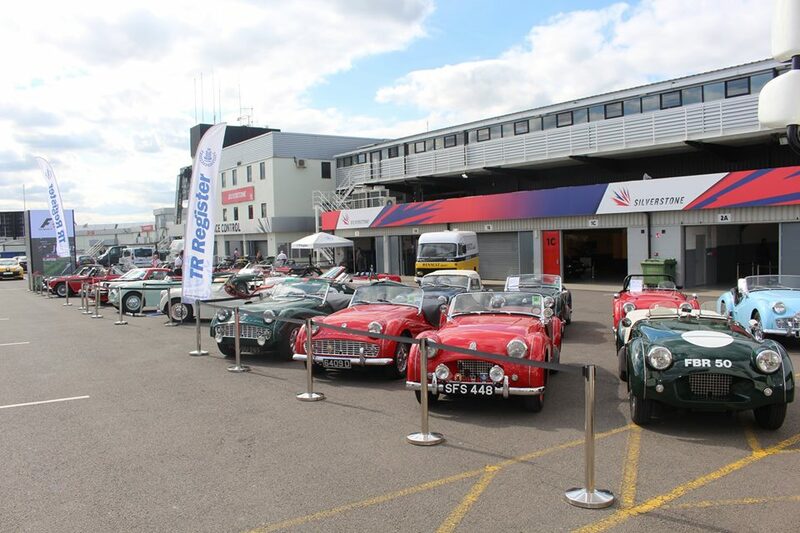 The TR Register member's cars in attendance covered the entire range of TR sports cars that Triumph produced between 1953 and 1982 and was available on display for the F1 fans throughout the weekend in the National Pits Paddock alongside a warm and friendly welcome from the club members all volunteering to man the display in shifts throughout the four days to share information on the cars with the general public. Qualifying on Saturday was a predictably cold and drizzly affair and quite shock to the system for many of the F1 drivers out on track. By the time the third qualifying session had completed though, the fans realised that it would be Brit Lewis Hamilton on pole and the atmosphere was electric. 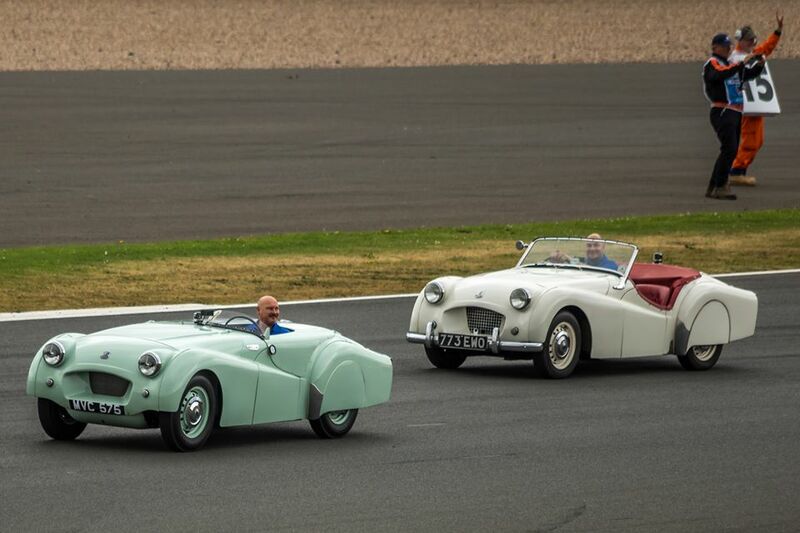 The opportunity for TRs to open the 2017 British Grand Prix came about thanks to the initiative of club member Ian Smith, a TR2 owner from the Chiltern area group. 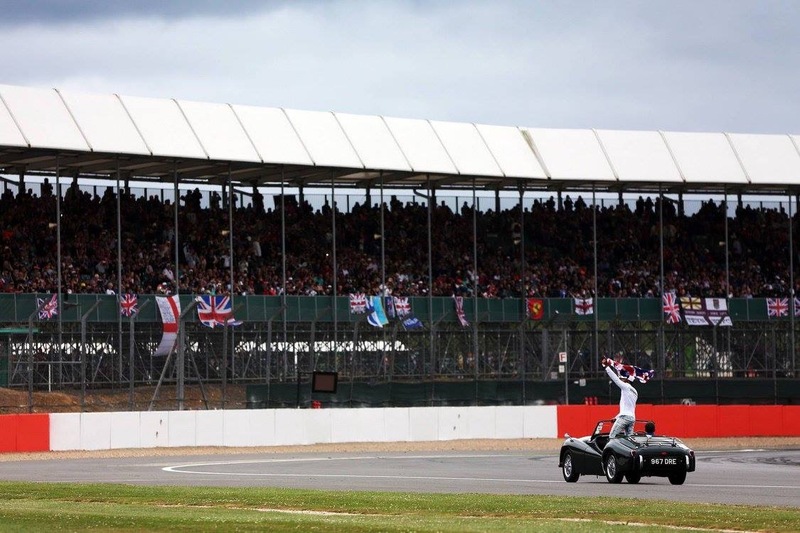 He had a dream and ambition to see TRs at the British Grand Prix so when he managed (through a contact from a chance meeting in his local pub) to get us a foot in the door with a meeting, we worked hard to ensure he had all the help and support he needed to realise his ambition of taking TRs to the British Grand Prix. 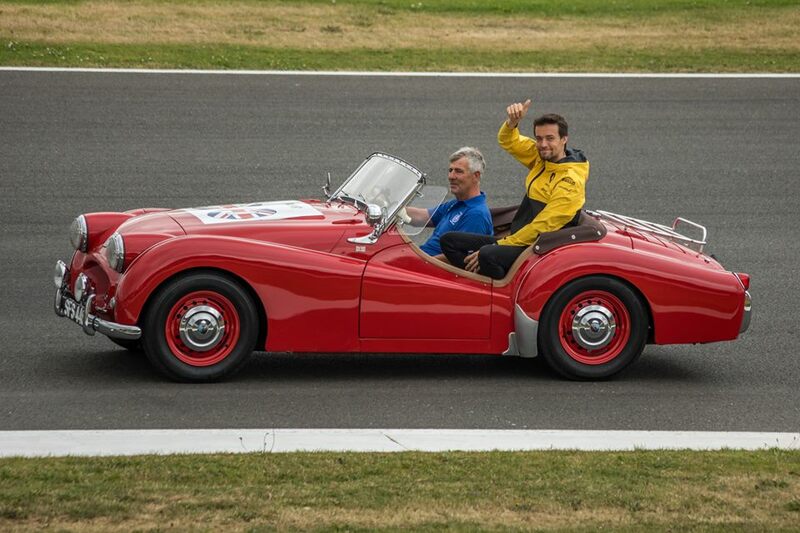 Several pages of proposals, spreadsheets and hundreds of emails later and with only a few days left to go, the dream became reality, the proposals were confirmed and the TR Register headed to Silverstone to open the British Grand Prix. 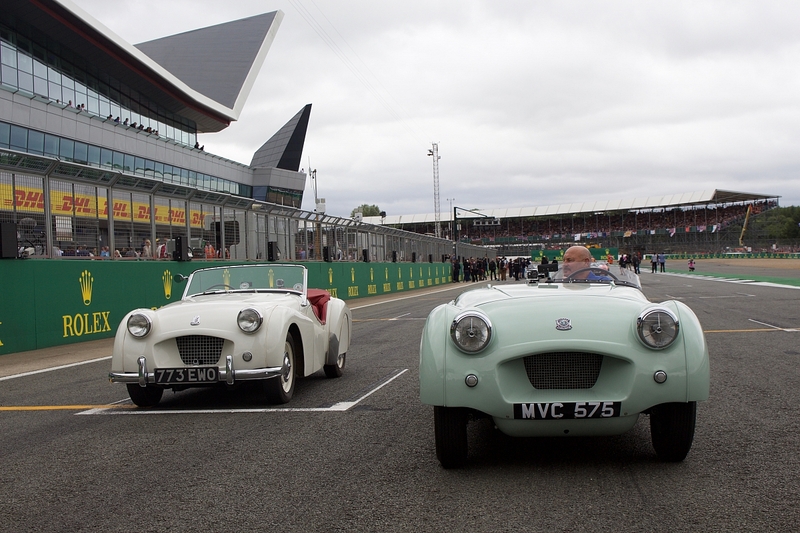 Twenty eight TRs from the earliest TR2 to the latest Grinnall bodied TR7V8 carried the F1 drivers around the circuit on race day following behind TS2, the first right hand drive Triumph TR ever made and MVC575, the TR2 that broke the land speed record in 1953. To the rear was the works rally TR7V8 campaigned so successfully by Simo Lampinen in the late 1970s to complete the line up that also included two tributes to the 1959 Le Mans TR3S race cars amongst members cars from across the country. 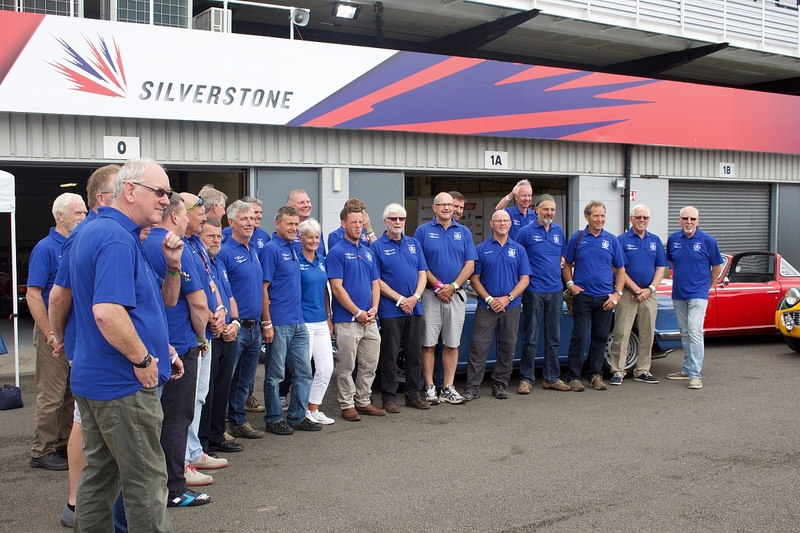 Raceday began early when, at 8am the marshals attended the TR display in the paddock which was shared with the Williams Heritage team to stick decals onto the TRs that had been awarded F1 drivers. 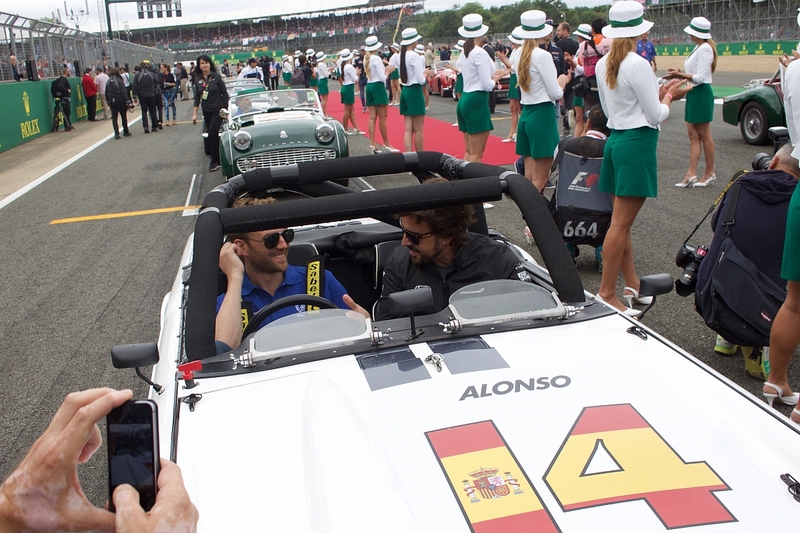 It was only at this point and when the team shirts were given out that team members had any idea of who they were to chauffeur around the circuit. As the marshals applied stickers to the cars, the MSA arrived for a safety briefing before TR Register Chairman Paul Hogan cut a celebratory cake made by Ian Smith's wife, Julie. 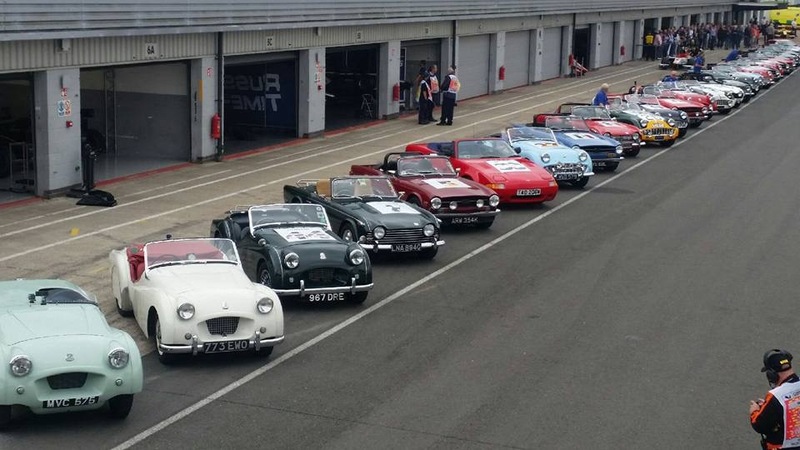 The TRs were then arranged behind TS2 and the Jabbeke land speed car into grid positions to match the qualifying results from the previous afternoon before they were driven out and parked "Le Mans style" in herringbone fashion along the national pitlane to await the course car. 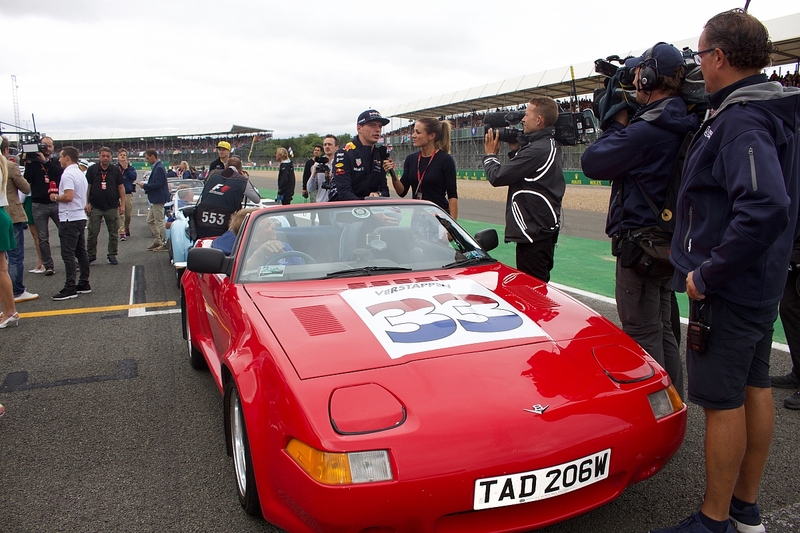 When that course car came it was but a few short, adrenalin filled moments until the TRs were lined up on the main pit straight, in front of hundreds of thousands of fans. The atmosphere was incredible, the world's media crammed and bustled around the TRs, eagerly awaiting the F1 drivers to appear and when they did the TR Register members in their respective TRs were in the firing line of a barrage of flash photography and logo emblazoned microphones. Recognisable faces from TV and the world of motorsport were busy delivering their "pieces to camera." 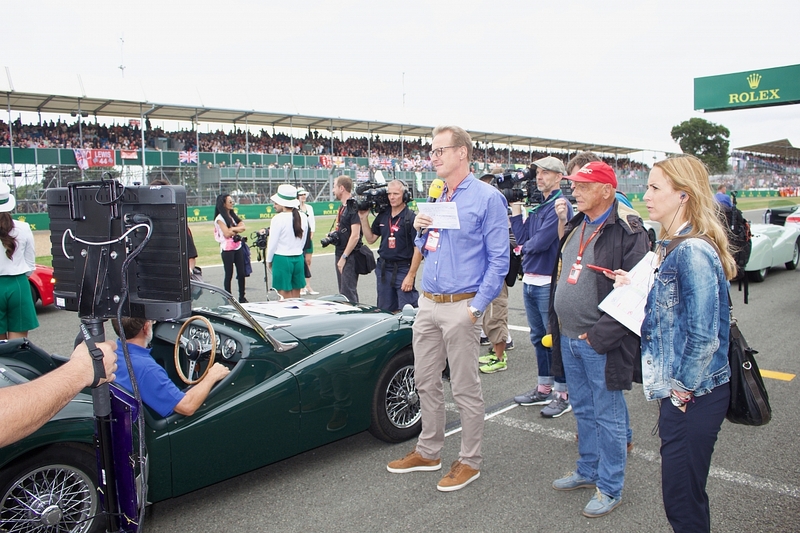 Martin Brundle, Damon Hill, Nikki Lauda and Natalie Pinkham were all wending their way in between the TRs chatting with the various drivers and TR Register members. 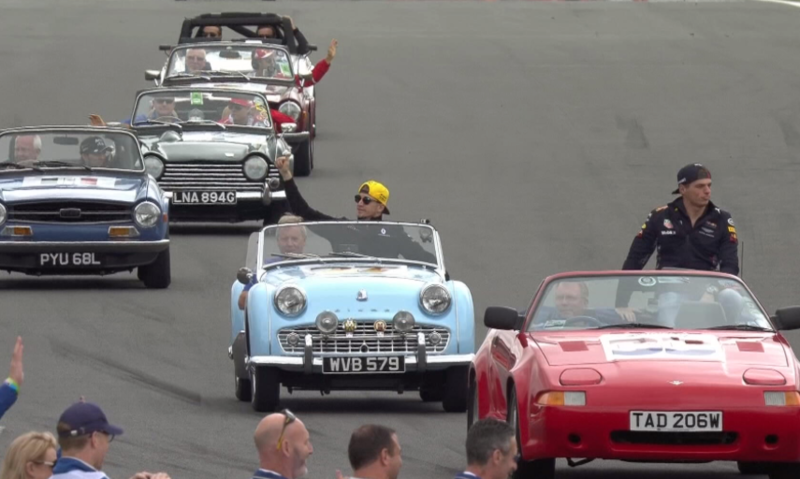 Soon it was all over as the course car pulled away and the convoy set off for the lap of the track, the crowd shouting and cheering as their favourite driver came into view. 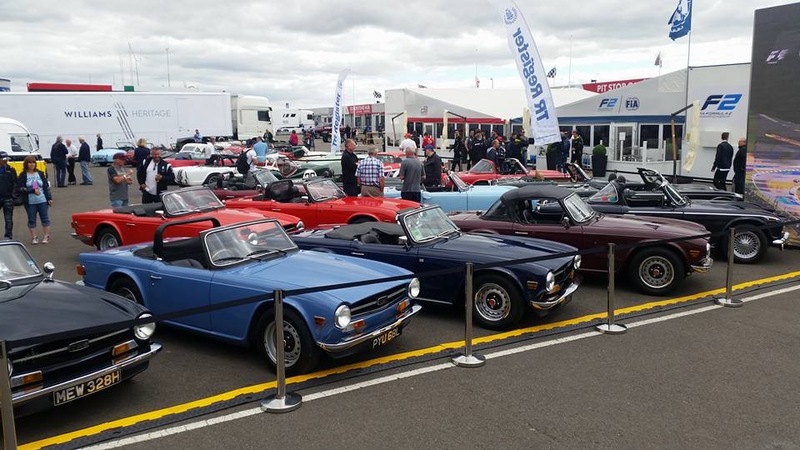 "Usually the drivers are herded onto a truck and driven around the circuit, this year was something a bit different and it seemed to be really well received by the drivers and media alike," said Wayne Scott, TR Register Press Officer. 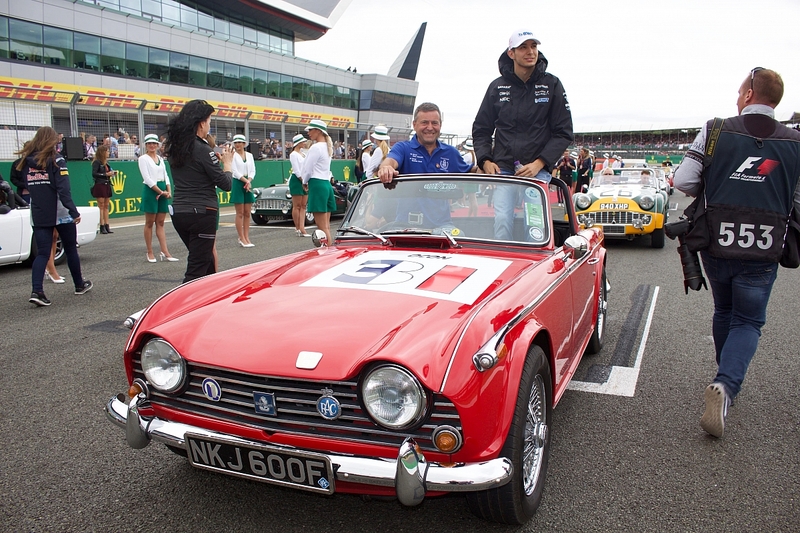 Indeed, many of the drivers remarked on how much they enjoyed the parade; "The cars are really cool, my father used to own a TR7," remarked past champion Sebastien Vettel. 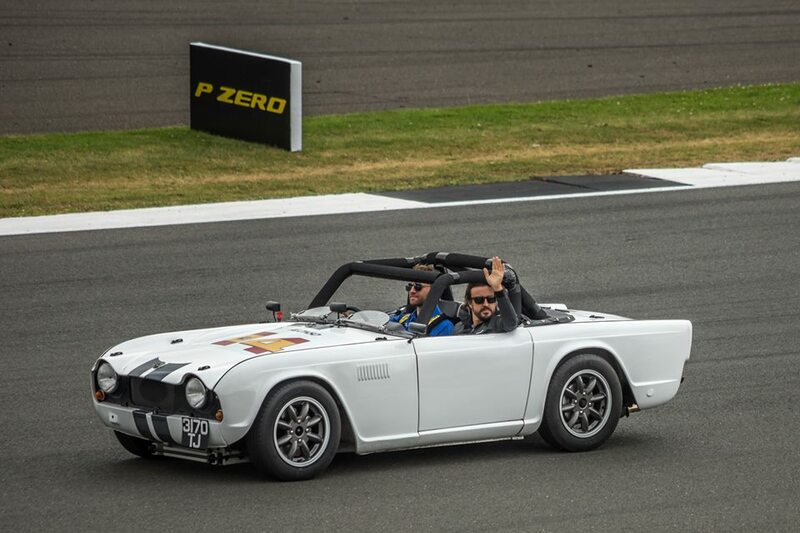 "I wanted the white TR4 out on track, that's awesome" enthused Max Verstappen from the rear seat of Phil Horsley's Grinnall bodied TR7V8. 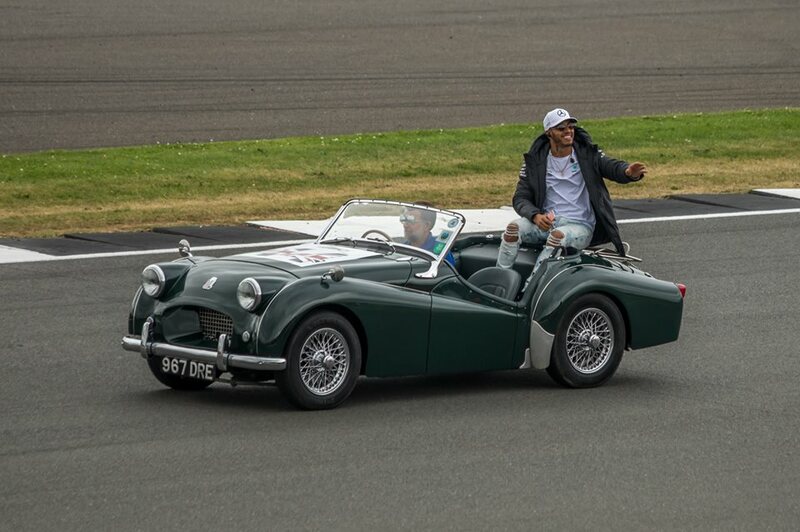 "It's important to get out and see the fans before the race, they need to know that I see them and appreciate their love and support," explained Lewis Hamilton. 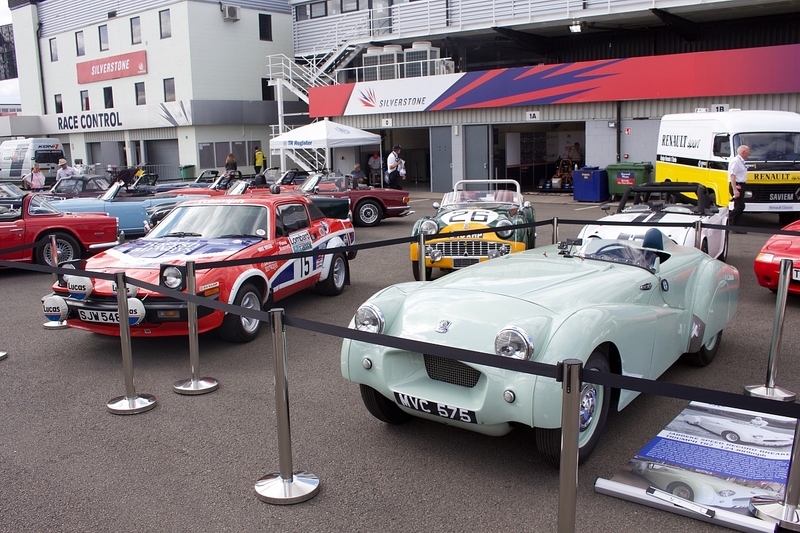 For the TR Register it was a massive honour, a once in a lifetime opportunity to not only show off the wide varied Triumph TR range in front of the worlds motorsport fans but also to fly the flag for the entire classic car scene in front of a global audience. For Ian Smith, who receives a massive vote of thanks from the entire club, it was the realisation of a dream. To finish off the race with a Lewis Hamilton victory was just the icing on the cake. Excellent enterprise - congratulations to all concerned.